​There is nothing worse than being stuck on a training plateau. Plateaus are inevitable and, unfortunately, everyone hits them. I’ve hit my share that I thought I would never get past. After learning more and experimenting with various methods over the years, I believe that I now have a great understanding of what is needed in order to break through current plateaus. Transitioning into higher volume and increased frequency is always a good way to start when preparing to break the plateau. This program will have you doing just that, allowing your body to gradually adjust to the change. 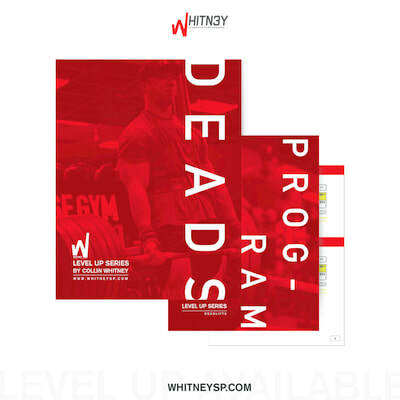 This program will also include plenty of exercise variation and accessory exercises that support the primary movements needed to put you in the position to break your PRs and LEVEL UP! These are single lift programs designed to be ran individually. You could run two programs simultaneously if you have a higher work capacity. Personally, I do not recommend running all 3 programs simultaneously. The recommended work load would be very high and this will most likely lead to overtraining, hindering your progression.